To read P.O. Lajeunesse's story in his own words, click HERE. Proudly displaying five stars on his service bars to show that he participated in 13 major naval engagements during the present global war, Machinist's Mate, First Class, Eugene E. Lajeunesse, son of Mrs. George Wilson, 348 Locust avenue, is spending a 30-day leave at his home here, coming to Amsterdam from Treasure Island, Calif., to which post he will return, unless his leave is extended, on september 17, and where he will be transferred to transport service after one of the most strenuouse and thrilling careers any local boy in Uncle Sam's Navy has experienced up to the present time. Petty Officer Lajeunesse, who was only recently promoted in rating, was aboard the ill-fated U.S.S. Helena when the cruiser was sunk by the Japs in the Battle of Kula Gulf on July 6 last. The local lad said he lost “everything but my skin” in that famous episode, and he was in the water for a little more than three hours before being picked up by a destroyer. He escaped with a minor injury to one of his ears which did not even require hospitalization, and, all in all, he considers himself mighty lucky. However, Petty Officer Lajeunesse is proud of the noble fight put up by the Helena after being vitally hit. Before sinking the cruiser sent at least three Jap ships to the bottom with her. 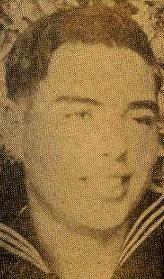 Enlisting in the Navy December 5, 1940, Petty Officer Lajeuneese has a wealth of experience and many thrilling incidents behind him now. He was aboard the Helena in the famous sneak attack of the Japs at Pearly Harbor on December 7, 1941. Thereafter and up to the time the Helena went down the cruiser became the idol of every member of her crew and it was with great sorrow they saw their beloved ship gradually sink under the surface of the water at Kula Gulf while they struggled to avoid being victims of the deadly Jap fire which reigned during this major engagement in which the enemy finally took a bad beating. Petty Officer Lajeunesse wears two silver stars, each one denoting five major sea engagements, and three bronze stars, representing a single engagement each. He has earned them in a gallant and courageous manner and it seems almost Providential that he returns to his home safe and unscarred to enjoy a leave he so richly deserves. But there is a touch of irony to the visit. The brave and heroic Amsterdam sailor who successfully withstood the fierce assaults of the enemy, sometimes having almost miraculous escapes from being wounded, and even killed, had joyous anticipation of a “good time with the car” when he returned home. “Now how am I going to get a good time on five gallons of gas?” was his reflection today as he learned of the restrictions on the amount of gas allowed furloughed soldiers and sailors. Well here's hoping that Petty Officer Lajeunesse, who made many sacrifices for the cause of America, will have a good time while he is back home and his friends who have any spare gas could do no better than share their supply with such a gallant hero who really knows what war is.